French cuisine (French: cuisine française, IPA: [kɥi.zin fʁɑ.sɛz]) consists of cooking traditions and practices from France, famous for the rich tastes and subtle nuances with long and rich history. France, a country famous for its agriculture and independently minded peasants, was long a creative powerbase for delicious recipes, that are both healthy and refined. There are many dishes that are considered part of French national cuisine today. A meal often consists of three courses, hors d’œuvre or entrée (introductory course, sometimes soup), plat principal (main course), fromage (cheese course) and/or dessert, sometimes with a salad offered before the cheese or dessert. 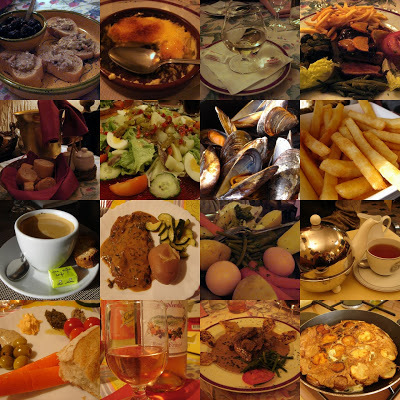 French cuisine varies according to the season. In summer, salads and fruit dishes are popular because they are refreshing and produce is inexpensive and abundant. Greengrocers prefer to sell their fruit and vegetables at lower prices if needed, rather than see them rot in the heat. At the end of summer, mushrooms become plentiful and appear in stews throughout France. The hunting season begins in September and runs through February. Game of all kinds is eaten, often in elaborate dishes that celebrate the success of the hunt. Shellfish are at their peak when winter turns to spring, and oysters appear in restaurants in large quantities. With the advent of deep-freeze and the air-conditioned hypermarché, these seasonal variations are less marked than hitherto, but they are still observed, in some cases due to legal restrictions. Crayfish, for example, have a short season and it is illegal to catch them out of season. Moreover, they do not freeze well. French regional cuisines use locally grown vegetables, such as pomme de terre (potato), blé (wheat), haricots verts (a type of French green bean), carotte (carrot), poireau (leek), navet (turnip), aubergine (eggplant), courgette (zucchini), and échalotte (shallot). French regional cuisines use locally grown fungi, such as truffe (truffle), champignon de Paris (button mushroom), chanterelle ou girolle (chanterelle), pleurote (en huître) (oyster mushrooms), and cèpes (porcini). Common fruits include oranges, tomatoes, tangerines, peaches, apricots, apples, pears, plums, cherries, strawberries, raspberries, redcurrants, blackberries, grapes, grapefruit, and blackcurrants. Varieties of meat consumed include poulet (chicken), pigeon (squab), dinde (turkey), canard (duck), oie (goose, the source of foie gras), bœuf (beef), veau (veal), porc (pork), agneau (lamb), mouton (mutton), lapin (rabbit), caille (quail), cheval (horse), grenouille (frog), and escargot (snails). Commonly consumed fish and seafood include cod, canned sardines, fresh sardines, canned tuna, fresh tuna, salmon, trout, mussels, herring, oysters, shrimp and calamari. Eggs are fine quality and often eaten as: omelettes, hard-boiled with mayonnaise, scrambled plain, scrambled haute cuisine preparation, œuf à la coque. Herbs and seasonings vary by region, and include fleur de sel, herbes de Provence, tarragon, rosemary, marjoram, lavender, thyme, fennel, and sage. Fresh fruit and vegetables, as well as fish and meat, can be purchased either from supermarkets or specialty shops. Street markets are held on certain days in most localities; some towns have a more permanent covered market enclosing food shops, especially meat and fish retailers. These have better shelter than the periodic street markets. In French cuisine, beverages that precede a meal are called apéritifs (literally: that opens the appetite), and can be served with amuse-bouches (literally: mouth amuser). Those that end it are called digestifs. The apéritif varies from region to region: Pastis is popular in the south of France, Crémant d’Alsace in the eastern region. Champagne can also be served. Kir, also called « Blanc-cassis », is a common and popular apéritif-cocktail made with a measure of crème de cassis (blackcurrant liqueur) topped up with white wine. The word Kir Royal is used when white wine is replaced with a Champagne wine. A simple glass of red wine, such as Beaujolais nouveau, can also be presented as an apéritif, accompanied by amuse-bouches. Some apéritifs can be fortified wines with added herbs, such as cinchona, gentian and vermouth. Trade names that sell well include Suze (the classic gentiane), Byrrh, Dubonnet, Noilly Prat. Digestifs are traditionally stronger, and include Cognac, Armagnac, Calvados and fruit alcohols. Thank you for thhe auspicious writeup. It in fact was a amusement account it. Look advanced to far added agreeale from you! By the way, how can we communicate? I keep listening to the news bulletin lecture about receiving boundless online grant applications so I have been looking around for the best site to get one. Could you tell me please, where could i acquire some? Wow, wonderful blog format! How lengthy have you been running a blog for? you make blogging glance easy. The entire glance of your web site is wonderful, let alone the content! whoah this blog is great i love studying your articles. Keep up the great work! You recognize, a lot of individuals are hunting around for this information, you can help them greatly. Hey there, You’ve done a great job. I’ll certainly digg it and personally recommend to my friends. I’m confident they will be benefited from this web site. hello there and thank you for your information – I’ve certainly picked up anything new from right here. I did however expertise a few technical issues using this website, since I experienced to reload the web site lots of times previous to I could get it to load correctly. I had been wondering if your web host is OK? Not that I’m complaining, but slow loading instances times will very frequently affect your placement in google and can damage your high quality score if ads and marketing with Adwords. Anyway I’m adding this RSS to my email and could look out for much more of your respective intriguing content. Ensure that you update this again very soon..
It’s appropriate time to make some plans for the future and it’s time to be happy. I have read this post and if I could I want to suggest you few interesting things or suggestions. Perhaps you could write next articles referring to this article. I want to read more things about it! Hello very cool site!! Man .. Beautiful .. Superb .. I’ll bookmark your blog and take the feeds additionally¡KI am satisfied to seek out numerous helpful information right here in the post, we want work out extra techniques in this regard, thanks for sharing. . . . . .
Hiya, I am really glad I have found this information. Nowadays bloggers publish just about gossips and web and this is actually irritating. A good web site with exciting content, that is what I need. Thanks for keeping this web site, I will be visiting it. Do you do newsletters? Can not find it. Hi there very nice website!! Man .. Beautiful .. Superb .. I will bookmark your website and take the feeds also¡KI am glad to find so many useful information right here within the put up, we want develop extra strategies in this regard, thanks for sharing. . . . . .
lidice orgfamily proprios artic methane nhay impresion cialis gelule sampled exercise to last longer in bed for men lili prix du cialis en espagne. hello there and thank you for your information – I have certainly picked up anything new from right here. I did however expertise a few technical issues using this site, as I experienced to reload the site a lot of times previous to I could get it to load properly. I had been wondering if your hosting is OK? Not that I am complaining, but slow loading instances times will often affect your placement in google and could damage your high quality score if ads and marketing with Adwords. Anyway I’m adding this RSS to my email and could look out for a lot more of your respective interesting content. Ensure that you update this again very soon..
Hello! I know this is kinda off topic however I’d figured I’d ask. Would you be interested in trading links or maybe guest writing a blog article or vice-versa? My website covers a lot of the same subjects as yours and I believe we could greatly benefit from each other. If you happen to be interested feel free to send me an e-mail. I look forward to hearing from you! Excellent blog by the way! Thank you a lot for giving everyone an exceptionally remarkable possiblity to read in detail from this site. It is usually very enjoyable and as well , full of a lot of fun for me personally and my office colleagues to visit your site nearly three times in a week to read the fresh things you will have. And of course, I am usually impressed considering the sensational thoughts you serve. Selected two tips in this article are completely the most effective we have had. Hello.This post was extremely fascinating, particularly because I was looking for thoughts on this topic last week. You made certain good points there. I did a search on the subject and found most persons will have the same opinion with your blog. Excellent website. Lots of useful information here. I am sending it to a few friends ans also sharing in delicious. And obviously, thanks to your effort! Thank you for sharing superb informations. Your site is so cool. I am impressed by the details that you¡¦ve on this blog. It reveals how nicely you understand this subject. Bookmarked this website page, will come back for more articles. You, my friend, ROCK! I found just the information I already searched all over the place and simply couldn’t come across. What a perfect web site. It¡¦s in point of fact a nice and useful piece of information. I¡¦m happy that you just shared this useful info with us. Please keep us informed like this. Thanks for sharing. You made some decent points there. I looked on the internet for the topic and found most persons will approve with your website. Thanks , I’ve just been searching for information approximately this subject for a while and yours is the greatest I’ve discovered so far. However, what concerning the bottom line? Are you certain in regards to the source? Hiya, I’m really glad I have found this information. Today bloggers publish only about gossips and web and this is really irritating. A good web site with interesting content, that’s what I need. Thank you for keeping this site, I will be visiting it. Do you do newsletters? Can’t find it. I do accept as true with all the ideas you have introduced to your post. They are very convincing and can certainly work. Still, the posts are very short for newbies. Could you please prolong them a bit from next time? Thank you for the post. Useful info. Fortunate me I discovered your web site unintentionally, and I am shocked why this twist of fate didn’t came about in advance! I bookmarked it. I’m not sure where you’re getting your information, but great topic. I needs to spend some time learning more or understanding more. Thanks for fantastic info I was looking for this information for my mission. I have learn several excellent stuff here. Certainly price bookmarking for revisiting. I surprise how a lot attempt you place to make this type of excellent informative web site. My wife and i ended up being quite fortunate that Michael managed to deal with his basic research from the ideas he acquired in your web pages. It is now and again perplexing just to possibly be giving freely thoughts which often people might have been selling. We really already know we have the writer to be grateful to because of that. All of the explanations you made, the simple site menu, the friendships you give support to instill – it is many great, and it is letting our son and us feel that the concept is exciting, and that is very vital. Many thanks for the whole lot! Thank you, I’ve recently been searching for information approximately this topic for a long time and yours is the greatest I have found out so far. But, what concerning the bottom line? Are you positive concerning the source? Whats Happening i’m new to this, I stumbled upon this I have discovered It absolutely useful and it has helped me out loads. I am hoping to contribute & help other users like its aided me. Good job. Hello there, I found your site via Google whilst looking for a similar matter, your web site came up, it seems to be good. I’ve bookmarked it in my google bookmarks. I cling on to listening to the reports talk about getting free online grant applications so I have been looking around for the finest site to get one. Could you advise me please, where could i find some? Hello there, I discovered your weblog via Google whilst in search of a similar topic, your internet internet site came up, it seems fantastic. I’ve bookmarked it in my google bookmarks. I wanted to write a brief note to be able to express gratitude to you for all the nice tricks you are sharing on this website. My extended internet look up has now been recognized with awesome points to write about with my family. I would admit that most of us site visitors are unquestionably fortunate to dwell in a wonderful community with many awesome professionals with interesting solutions. I feel very privileged to have encountered your weblog and look forward to plenty of more entertaining times reading here. Thank you again for everything. I like the valuable information you provide in your articles. I’ll bookmark your blog and check again here frequently. I am quite certain I’ll learn many new stuff right here! Good luck for the next! Hi, Neat post. There is a problem together with your website in web explorer, might test this¡K IE nonetheless is the marketplace chief and a huge portion of people will leave out your fantastic writing due to this problem. It is appropriate time to make some plans for the future and it’s time to be happy. I’ve read this post and if I could I desire to suggest you some interesting things or tips. Perhaps you could write next articles referring to this article. I desire to read even more things about it! It’s perfect time to make some plans for the future and it is time to be happy. I have read this post and if I could I desire to suggest you some interesting things or advice. Perhaps you can write next articles referring to this article. I wish to read more things about it! It¡¦s really a nice and useful piece of info. I am satisfied that you shared this useful info with us. Please keep us up to date like this. Thank you for sharing. Great remarkable issues here. I am very happy to peer your post. Thanks a lot and i am taking a look ahead to contact you. Will you please drop me a e-mail? hi!,I love your writing very a lot! percentage we keep up a correspondence more about your article on AOL? I need an expert in this area to resolve my problem. Maybe that’s you! Looking forward to look you. Hi my family member! I wish to say that this article is amazing, great written and come with approximately all important infos. I would like to see extra posts like this . You made some decent points there. I did a search on the subject matter and found most guys will approve with your website. I simply wanted to make a word in order to appreciate you for these fabulous tactics you are posting at this site. My incredibly long internet search has at the end been honored with reasonable knowledge to go over with my visitors. I would declare that most of us visitors are quite fortunate to dwell in a magnificent site with many perfect people with beneficial tips. I feel very much grateful to have seen your web pages and look forward to some more fabulous moments reading here. Thank you again for all the details. Wow! This could be one particular of the most useful blogs We’ve ever arrive across on this subject. Basically Great. I am also an expert in this topic so I can understand your effort. Hello, Just read this short article about OJ. Paul: …an IP place db may be used to make strong and accurate outcomes. Webmasters and content managers use this facility to alter content material, all depending on demographic preferences of on-line visitors. Consequently, the website likeability factor increases, without having leveraging the necessity of manually checking in every user profile… Isn’t he cause?. Simply desire to say your article is as surprising. The clarity in your post is just great and i could assume you’re an expert on this subject. Well with your permission allow me to grab your RSS feed to keep updated with forthcoming post. Thanks a million and please keep up the gratifying work. fantastic issues altogether, you simply gained a brand new reader. What may you suggest about your submit that you simply made a few days ago? Any positive? You could definitely see your expertise within the work you write. The arena hopes for more passionate writers such as you who are not afraid to say how they believe. Always go after your heart. I have read some good stuff here. Certainly value bookmarking for revisiting. I surprise how much effort you put to create this type of wonderful informative site. I am typically to blogging and that i seriously appreciate your internet site content material. This great short article has truly peaks my interest. My objective is to bookmark your web-site and sustain checking for brand spanking new data. hello!,I like your writing very much! share we keep up a correspondence more approximately your post on AOL? I need a specialist in this area to unravel my problem. Maybe that’s you! Taking a look forward to look you. Get a Free Shakeology Sample Today! I¡¦ve been exploring for a little for any high quality articles or weblog posts in this kind of house . Exploring in Yahoo I at last stumbled upon this web site. Studying this info So i am satisfied to exhibit that I have an incredibly excellent uncanny feeling I discovered just what I needed. I most unquestionably will make certain to do not fail to remember this website and provides it a look on a relentless basis. Wow, incredible blog format! How long have you ever been running a blog for? you make running a blog glance easy. The full glance of your web site is magnificent, as well as the content! hello there and thank you for your info – I have certainly picked up something new from right here. I did however expertise some technical issues using this website, as I experienced to reload the web site many times previous to I could get it to load correctly. I had been wondering if your web host is OK? Not that I’m complaining, but sluggish loading instances times will often affect your placement in google and can damage your quality score if ads and marketing with Adwords. Well I’m adding this RSS to my email and could look out for a lot more of your respective intriguing content. Ensure that you update this again soon..
Hello there, You have done an incredible job. I’ll certainly digg it and personally recommend to my friends. I am confident they will be benefited from this web site. I would like to thank you for the efforts you’ve put in writing this site. I’m hoping the same high-grade blog post from you in the upcoming as well. In fact your creative writing abilities has inspired me to get my own web site now. Really the blogging is spreading its wings quickly. Your write up is a good example of it. I was just seeking this information for a while. After six hours of continuous Googleing, at last I got it in your website. I wonder what is the lack of Google strategy that don’t rank this type of informative web sites in top of the list. Normally the top web sites are full of garbage. Well I definitely liked reading it. This article offered by you is very useful for accurate planning. Valuable info. Lucky me I discovered your website by chance, and I am stunned why this accident didn’t came about in advance! I bookmarked it. Hi my friend! I want to say that this article is amazing, great written and include approximately all significant infos. I would like to see more posts like this . I was just looking for this information for some time. After six hours of continuous Googleing, finally I got it in your web site. I wonder what is the lack of Google strategy that do not rank this kind of informative web sites in top of the list. Normally the top sites are full of garbage. Hi there! I know this is kinda off topic but I’d figured I’d ask. Would you be interested in exchanging links or maybe guest authoring a blog post or vice-versa? My website addresses a lot of the same subjects as yours and I feel we could greatly benefit from each other. If you might be interested feel free to send me an e-mail. I look forward to hearing from you! Superb blog by the way! Wow! This can be one particular of the most helpful blogs We’ve ever arrive across on this subject. Basically Excellent. I am also an expert in this topic so I can understand your hard work.